In recent months, Regal Plastics has been working to create a more efficient environment and improve the well being of our employees. We have started implementing lean manufacturing into every aspect of the business from the corporate office to the warehouse to the sale’s floor. What is lean? Basically lean is removing waste by improving organization and processes. Here is an article with more in-depth information, http://sfmagazine.com/post-entry/may-2015-fast-and-lean-the-fastcap-story/. The idea of lean manufacturing has been causing us to examine long standing processes with fresh eyes. The more we examined how our sales staff was working, the more perspective we gained on how we could improve it. We noticed that with the traditional cubical, it was difficult for our sales team to see customers at the counter and interact with each other. Also, there was wasted time and motion every time our sales rep would stand up and sit down. It simply was slow and unproductive. Another deciding factor to make the switch, was the research describing the negative long-term affects of sitting all day. Chronic back pain, obesity, and a shorter life span have all been attributed to sitting daily for prolonged periods. 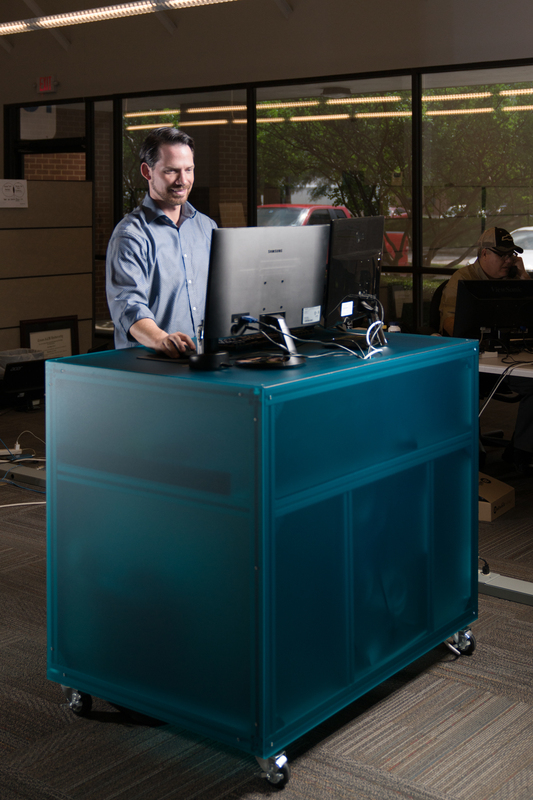 It became clear that stand-up desks were the next necessary step to improve life at Regal Plastics. When were designing the desks, there were several factors that played a role in the design. Each desk is produced with wheels. This gives our team the option to easily move their work station. 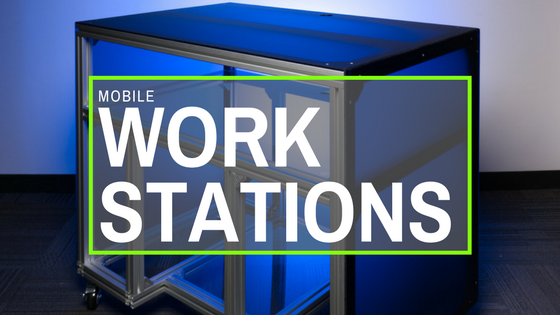 Each work station is fabricated with bausch aluminum and RegalFROST. The aluminum is strong yet light weight making it easy to navigate the work stations around the office. The RegalFROST acrylic has a matte finish to help guard against scratching. Comfort was a primary concern when it came to fabricating the desks. Each sales person has a desk fabricated to their height so they are able to keep their arms at a comfortable ninety degree angle without having to stoop to see their screen. 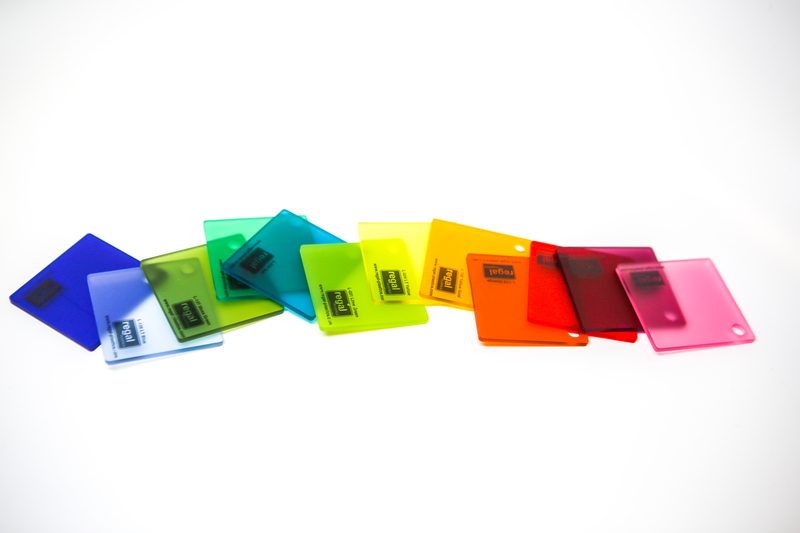 Also, the RegalFROST acrylic is available in twelve exclusive matte colors only found at Regal Plastics. The mobile work stations have already changed the mood around the office. The bright colors tie right into our showroom. The staff is on their feet, ready to assist customers. Communication is open among the team. Before, you would have to pick up the phone and call the person in the cubicle next to you. Best of all, our staff feels better! Their productivity has increased and they are finding it easier to have the positive attitude we strive to present to customers. It was such an immediate change that our customers noticed that the atmosphere was different the minute they walked through the door. Not to mention, we sold three work stations the afternoon they were rolled in. Our sales rep is all smiles behind his teal mobile work station.